Using the best organic flour, milled by Shipton Mill where their flour has been stone ground since the Doomsday book. Sea salt, filtered water and the best organic ingredients ensure that the bread you eat is of the highest quality. All our bread is suitable for vegans and vegetarians and our gluten free bread is truly exceptional! We only pick highly skilled artisans with a real passion for baking and traditional methods to become part of Judges bakery. With quality ingredients being used by our highly skilled bakers, you know that our bread is the best you can get. With over 30 different types of bread baked daily, we can honestly say that you will be spoiled for choice. Click below for details or view the Gallery Carousel. A true sourdough, delicious chewy texture with a flavoursome crust using just three ingredients, Flour, Filtered Water & Sea Salt. We use a 2 day fermentation method on all our sourdoughs which breaks down carbohydrates and proteins making them easier to digest. This is the perfect loaf! We make our Rye using a 18 hour fermentation. As well as being a sourdough this bread has a really high protein & fibre content with very low gluten, along with good levels of Zinc, Iron & Calcium. Delicious with smoked cheese or smoked fish. Spelt is an ancient grain that has a slightly sweet and nutty flavour, slightly dense due to its low gluten content, however this makes a great alternative to regular wheat being easier to digest. Compared to wheat, spelt is richer in many nutrients and especially high in Niacin which improves circulation and reduces cholesterol. We dip ours in Sunflower andPumpkin seeds. 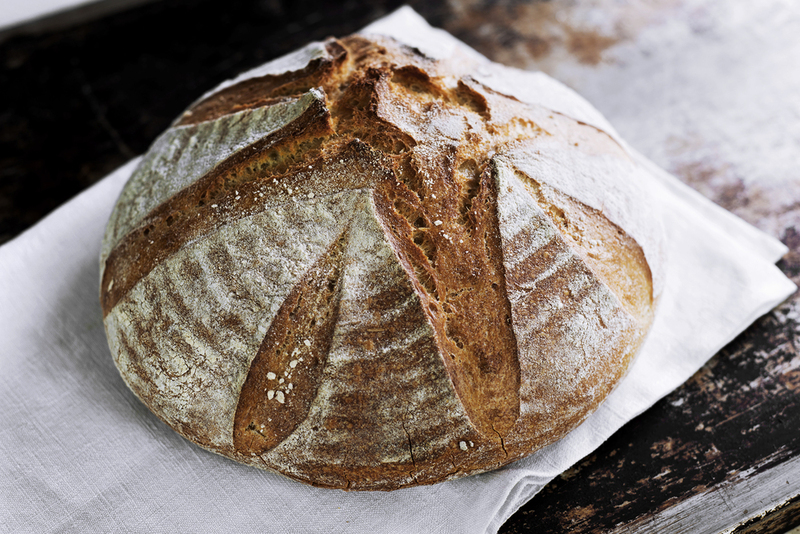 Made using a traditional French recipe which includes a combination of Rye, Wholemeal and White flour. Rich in flavour using quality Organic Stoneground flour making this an excellent everyday loaf. Probably the most nutritional loaf in the shop! Made with malted flour and our secret seven seed combination makes this a very popular loaf at the weekends. (only available weekends!) . This loaf is left for 24 hours to prove for maximum taste. Yes this is a totally gluten free loaf. Very dense due to the absence of Gluten. However it is packed with sunflower seeds and slightly sweetened with molasses it makes an exceptionally healthy and great tasting loaf. A truly excellent artisan loaf, flour, water, tiny amount of yeast , salt and lashings of Olive Oil. Which is hand mixed and left overnight. When proved it is then stone baked on the sole of a hot oven. Makes an excellent addition to meal times. Truly the king of sourdoughs. Made with malted flour for a sweeter taste and packed with lightly toasted walnuts. This bread makes a fantastic partner for cheese or try toasting with honey. We make exceptional morning goods, croissants, pain au raisen, pain au chocolate, chocolate twists and almond croissants. All made using a long fermentation method and real butter for maximum flavour and of course no additives. Made and baked fresh on the premises 7 days a week.